Smile design is a highly technical process requiring great skill and experience to achieve a natural looking beautiful smile. At Wycherleys dental practice we use are artistic ability and extensive knowledge to create the smile you desire using techniques that require precise measurements based upon your mouth shape, gum lines, lips and natural shape of the teeth. Using a combination of your desires and our expertise, we carefully select the cosmetic procedures and methods to achieve the most desirable, natural looking smile for you. These can range from simple composite bonding and tooth whitening to beautiful porcelain veneers, or strong, durable crowns meticulously custom made for you. The bite is carefully analysed for total comfort and the colour verified, along with details such as the surface texture and lustre to ensure your smile looks and feels completely natural. We never compromise on materials and only use the best available. You also have the peace of mind knowing we have undergone extensive postgraduate training in private cosmetic dentistry to deliver your dream smile. smile desires and expectations. We use digital photography to create before and after images so that you can see the results of your cosmetic dentistry, in addition, digital x-rays and intra-oral camera’s allow for expert evaluation and precise planning of your cosmetic procedure. We also use a facebow which records how your teeth and jaws articulate together and have a diagnostic wax up made of your ‘finished smile’ so you can see the finished results before we start treatment. We show you some examples of ‘smiles’ that you can choose from or customise and suggest you bring in any photos of celebrity smiles that you like. Once all this information is taken we then send it off the laboratory where your smile is produced in wax for approval at your next appointment, this is normally in about 2 weeks. At the review appointment we show you the diagnostic wax up which has been designed for you, this gives you chance to change anything thing that you don’t like. We also go through in detail your treatment plan and discuss which materials are available for you, this may include the use of implants. Once you are happy and have approved your smile design we get all the relevant consent forms signed and a deposit is taken to start treatment. At this appointment your existing teeth are reshaped and prepared ready for your ‘temporary smile’. You will leave this appointment with an exact copy of what your finished smile will look like. The temporary restorations we fabricate allow you to ‘trial your smile’, get used to how your new smile will look and feel and show your friends and family. You may decide that there things you don’t like and want to change and this gives you a chance to make sure the look is right for you. After you have had your trial with your new smile we see you again to check that you are happy with how it looks and feels. 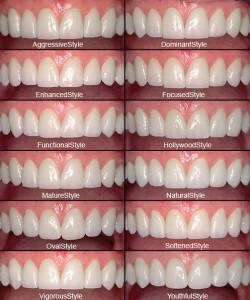 If you are happy we then remove the temporary ‘smile’ and tidy up the prepared teeth ready for the final impressions. The impressions are then sent to the laboratory to make your permanent smile. You are then fitted with another temporary set until your permanent ones are ready, this normally takes approximately 10 days depending on the complexity of the case. The length of a standard Smile design from start to finish is 6 weeks. However the length of treatment is determined by the complexity of the case, for example if you require dental implant treatment. This will be discussed with you at your initial consultation. We welcome patients from Newport, Telford, Shropshire county and surrounding areas and are able to offer appointments weekdays, Saturdays and late evenings. We look forward to welcoming you to Wycherleys Dental Practice and providing you with a beautiful smile that you can be proud of. Please check out our Testimonials from patients who have had treatment with us.